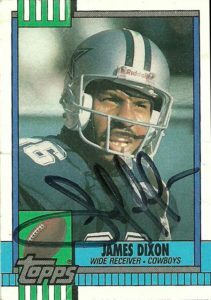 I think James Dixon was the first Action Packed card I ever got autographed. After being cut by the Detroit Lions in the preseason, James would be a savvy free agent find by Jimmy Johnson. 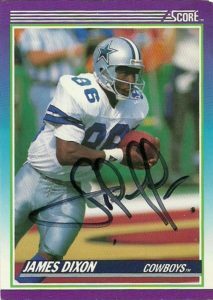 Originally from the University of Houston in 1989, Dixon was a speedy special teams player and kick returner. 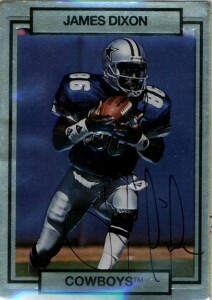 His rookie season was a great start as James 47 returns led the NFL in 1990, while his 1181 yards would rank 3rd. 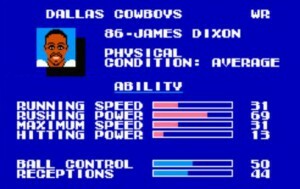 Dixon’s return numbers in fact were the highest seen by a Dallas Cowboy since the merger. He’d also chock in a 97 yard touchdown. 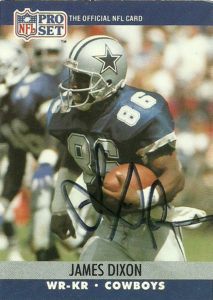 Dixon was the Cowboys primary long bomb threat, averaging just below 20 yards a catch on 477 yards receiving. He’d have 2 TDs receiving, including a 75 yard bomb. These would all be career highs as his return yardage and receiving statistics would slip until 1991 when he only suited up for 7 games. It’d be enough for him to make the cut for Tecmo Super Bowl. 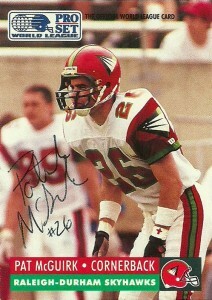 James later resurfaced in the Arena leagues in 1994 playing for Fort Worth. He’d make 9 td grabs on 405 yards.